Chota Lal became our cook. When we lived at Redburn Oaks we needed someone to clean house. Our cook at that time asked if we would like to hire his nephew, Chota Lal, to do house cleaning. We did. And between his duties (sweeping, making the beds, cleaning toilets, running chits to other homes etc), his uncle taught him how to cook. Chota Lal was dutiful, cheerful, learned quickly, was alert and generally kept out of everyone’s way. When we came back from furlough in ’63 he became our full time cook. He was single, and young–in his early twenties. He had curly hair and, it turned out, fancied himself a ladies’ man. You remember the perennial problem with Lucy and Charlie Brown and the football? She always removes it at the last moment. And Charlie believes her every year. What an idiot. You’d think he’d learn. A bit like Lucy, we used to hold our bowl every morning for him to fill with hot oatmeal, our standard breakfast. And he would start to fill it. We would ask for one more dollop. He would oblige. We would remove the bowl at the last moment and PLOP the oatmeal would go on the floor. Chuckle chuckle. He got so he would not serve anything into a bowl that was not in his own hand or placed on the counter. Chota Lal lived down in the bazaar. He was at our house by shortly after 6AM. He would be there until after lunch was cleared and dishes washed. Then he would head home for a break and be back by 4 PM or so. Something around an hour of that was the walk to and from town. Chota Lal smoked bidees, the cheapest smoke around, the smoke of choice among the poor. Interestingly, he never tried to get us to smoke anything, but he was always willing to horse around. In fact, in many ways he was just a big kid. 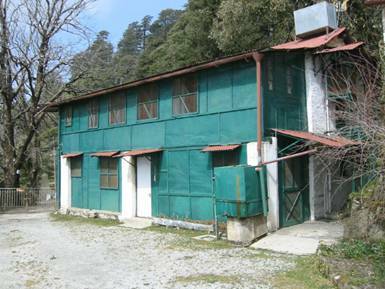 When I was a junior we started spending the first two weeks of December at Dhanaulti hunting. At the return of that first venture we discovered that Chota Lal had been fired. This was pretty dramatic. Servants were seldom fired out of hand. Even if caught with their pockets full of sugar they were almost always given a second chance…which often gave them a second chance to perfect ways to do this so they would not get caught. It seems Chota Lal had an eye on Santu’s daughter next door. Santu was the chowkidar (watchman) at Ellengown (the Mennonite compound next to us). With his full walrus mustache and white pugaree (turban) which he wore to great effect, he commanded his compound well. Chynoweth – our home for five years – had once been a stable (below) and servants’ quarters (above). Note the tank on roof. This allowed us to have water when no water was being pumped through the lines. Chota Lal, it seems, was stealing a different type of sugar. He was making cakes for this wonderful gal with ingredients from our larder. And, it seems, had invited her over for tea (and who knows what else) when everyone else was out. Hmmm. Somehow I think mom must have caught him in an extremely compromising position. Or Santu had threatened his life. This sort of a dalliance, though forgivable in the West is not tolerated at all in the East where boy-girl relationships are micro-managed. Chota Lal had gone too far. There was no way mom was going to allow us to pull the bowl out from her last dollop of oatmeal, that was for sure.